BaronessTanni Grey-Thompson is Britain's most successful Paralympic athlete ever! Tanni Grey-Thompson is now Britain's best-known Paralympic athlete, having performed at world-class level, in distances ranging from 100m to the marathon. Tanni's career has taken her around the world to every major international event. Her 16 Paralympic medals including 11 golds, six gold medals in the London Marathon and her comprehensive set of British and World Records make her achievements second to none in the disability sport arena. Tanni has received numerous accolades and awards in recognition of her Paralympic and sporting achievements, she was awarded third place in the BBC Sports Personality of the Year 2000, has become BBC Wales Sports Personality of the Year three times, taken the title 'Welsh Woman of the Year' and many more. In 2000 Tanni was decorated with the OBE in the Millennium New Years Honours List in honour of her services to sport and in 2004 was awarded a Dame hood. Tanni is member of the Laureus World Sports alongside such sporting legends as Pele, Jack Nicklaus, Michael Jordan, Boris Becker, Ed Moses, placing her firmly alongside the world's leading sporting celebrities. Alongside this impressive list of sporting and media achievements Tanni has been active in the administration, management and politics of sport. Tanni has lobbied and promoted many issues and causes associated with disability sport and disability in general, resulting in a much higher profile for sports for people with disabilities, and improved access and understanding of the people and sports involved. Currently Tanni plays an active role within disability athletics as the Assistant Head of the Potential Programme, which has the responsibility for recognising and developing young disabled athletes to form the nucleus of a squad for the Beijing Paralympics in 2008. Tanni is articulate and well informed; and is an exceptional conference and motivational speaker. Tanni is at ease talking to schoolchildren or professionals and one of her greatest achievements must be in making people more aware of disability and what can be accomplished with will-power, determination and the support of a loving family. 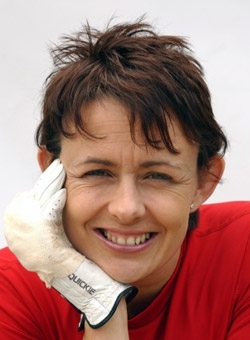 Tanni has now retired from International competition and lives in Redcar with her husband, Dr. Ian Thompson and their daughter Carys, who was born in February 2002.